What is The Wattage You Need in A Soldering Gun or Iron? We are back with another important thread of discussion. In this article, we are discussing about one of the important question that you might have. How much wattage the soldering gun or iron should have? Well, you see, soldering gun (or iron) is used in variety of applications such as electronics, sheet metal , mechanical assemblies and more advanced industrial applications. What really matters if the right amount of temperature that is required to hold the gun hot, not the wattage it is designated with. Does it mean that wattage is not important? Wattage is important because wattage specifies the maximum power the soldering gun can carry. Based on the wattage, the temperature it operates varies. How much wattage I need for a soldering gun? It depends on the the application in which you are using the soldering gun. For example, if you are going to solder electronic components such as PCB(printed circuit boards) or resistors, it would be sufficient to get a 15 Watt soldering iron. For soldering larger components such as voltage regulators you may have to go for a 25 Watt soldering gun. For heavy duty industrial applications, you need a soldering gun of 300 or more wattage power. Coming to soldering wires, you may need 15 Watt for soldering a 14 Gauge wire, 25 Watt for 12 Gauge and 40 Watt for a 10 gauge wire. For solder jobs of larger things such as heat sinks or similar components, you may need soldering gun having wattage of 50 watts and above. What’s really important in soldering job is the ability to control the temperature while you are on the job. Because, as you continue with your soldering job, the temperature drops. Soldering iron needs time to recover its tip’s temperature. There is also a danger of excess temperature damaging components of PCB s if continuous heat is applied. That’s the exact reason, now a days, modern soldering stations are coming with temperature control features. For example, Weller WES51 controls the temperature delivered to soldering tip automatically so that it remains at a constant temperature. In a nutshell, the wattage you need in your soldering gun depends on the application for which you are using the gun for. 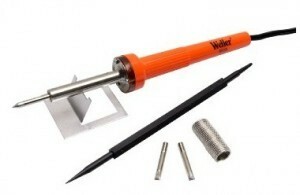 So pick up the right wattage soldering gun and deliver a great soldering job which looks nice and professional. Hope this article was informative and useful. At BestSolderingGun.com , our efforts are to provide you with reliable and practical information about soldering guns and irons. Keep connected with us.